It would seem that Jerusalem has returned to the center of the world. On the one hand, the US and Europe is insisting that any government-approved real estate development in East Jerusalem is contrary to international law and tantamount to ‘suicide’, and on the other hand Haredi (ultra-orthodox) residents of Jerusalem are fighting to reject the authority of the elected Mayor and scorn the rule of the State over the holy city. 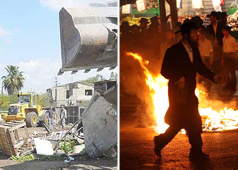 Government statements are unequivocal in rejecting the claims of both the international community on the one hand, and the Haredi protesters on the other hand. But on the ground there is mounting pressure from the US on the East Jerusalem issue and Haredi demonstrations growing in number and aggression, coupled with the fact that few secular Israelis visit Jerusalem and even fewer Israelis venture into East Jerusalem. Some may feel Israel is losing control of its capital. And what of Jews throughout the world? Are we content with the future of Jewish residence in Jerusalem being taken out of Jewish hands? Are we willing to see the Jewish nature of our soul’s capital city be determined by a very specific definition of Jewish practice? As we move into the nine days leading up to the commemoration of the destruction of the Second Temple and the ruin of Jerusalem, we would do well to look carefully at our relationship to this city. Whether we call her Jerusalem of Gold, or Jerusalem of Iron, isn’t Jerusalem ours? And if so, then what is the shape, size, and nature of Jerusalem?